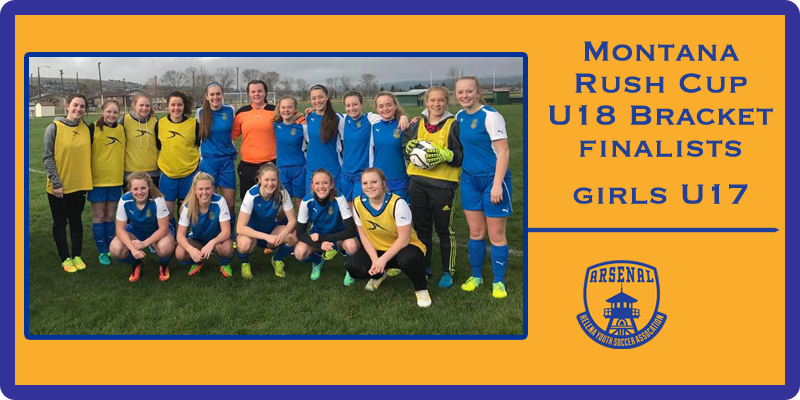 U17 Arsenal Girls, coached by Lance Melton with assistance from Lexi Steele and Rick Thompson, traveled to Great Falls for the Montana Rush Cup tournament and competed in the U18 bracket with a result of second place Finalist. In the first game on Saturday, Arsenal took on the tough North Idaho Inferno and came out on top 4-2. Goals were scored by Ellie Stiffler (assisted by Kinzi Adams), Cassie Brisko on a direct kick, Sydney Sheridan, and an own-goal off a Brisko corner. In the second game of the day, Arsenal battled the Montana Rush to a 2-2 tie, with both goals by Jaymee Sheridan (one assist from Adams). Going in to Sunday’s matches atop the standings but battling injuries, Arsenal subdued the Montana Rush U18 team 2-0, with goals by Sydney Sheridan (Adams assist) and Brisko on a PK. Arsenal again faced the North Idaho Inferno in the afternoon’s championship match and the battle raged on with neither team able to chip one in until the remaining minutes of the match, when Inferno hit the net to win 1-0. Rock solid defense by Arsenal players Audrey Arnold, Ty Cummings, Isabelle Melton, Kenzie Schulte, and Ellie Stock was key to the weekend success, while midfielders Melina Hammer, Megan Havron, Sarah Mueller, and Tasha Peterson and forward Claire Benedetti worked the field and created scoring opportunities for the offense. Goalkeeping duties were provided by Rachel Kosena. Arsenal U17G remain undefeated in league play (7-0) with an overall season record of 9-1-1.